Ponte Vedra, FL (August 23, 2018) E3, manufacturer of E3 DiamondFIRE spark plugs and performance products, is a sponsor this year of a beautiful 1940 Dodge truck custom built by Cool Hand Customs of Middleton, WI. 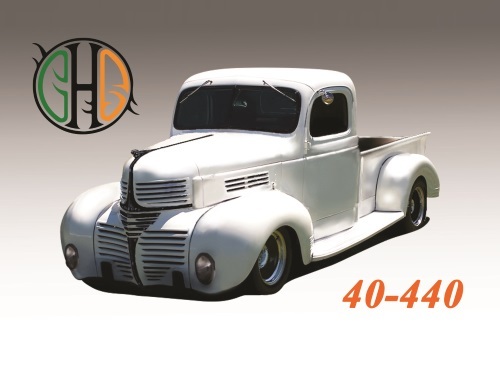 The truck will be the centerpiece attraction at E3’s booth for the 2018 SEMA Show, booth #71000, and will be entered into SEMA’s Battle of the Builders. E3 is a manufacturer of a full line of DiamondFIRE ignition products for street and race performance. In addition to the company’s E3 Spark Plugs, E3 manufactures DiamondFIRE racing spark plug wires, race distributors, a 6CDI ignition box, a high output CD coil, an external 2-step rev control, race O2 Sensor, electronic oil-filled can coil and E3 high output performance coils. Additionally, E3 is a major sponsor of motorsports and is the official ignition sponsor of NHRA and the title sponsor of E3 Spark Plugs Pro Mod Drag Racing Series, the official spark plug sponsor of NMRA and NMCA, the presenting sponsor of NMCA, and sponsor of Lucas Oil Off Road Racing Series, Lucas Oil Sprint Car Series, Lucas Oil Late Model Dirt Series, Lucas Oil Pro Pulling League, Lucas Oil Drag Boat Series and the Lucas Oil Drag Racing Series, Amsoil A.M.A. Arenacross, and American Flat Track. For more information about E3 spark plugs and performance ignition products, visit www.e3sparkplugs.com. For the latest company product news follow E3 on Facebook, Twitter, Google +, Instagram, or subscribe to E3’s You Tube Channel. Located in Middleton, WI, Cool Hand Customs is owned by Amy and EJ Fitzgerald. Inspired by the 1967 film “Cool Hand Luke” and the character played by Paul Newman who demonstrated a will to succeed and overcome no matter the odds, Cool Hand Customs specializes developing fabrication, custom paint and frame-up builds, especially pre-1980 resto-mods. For more information about Cool Hand Customs, call 608-513-0597 or 608-513-0596, email Amy at paintit@tds.net, or follow the company’s latest projects on Facebook. Cool Hand Customs is located at 2404 Clark Street Middleton, WI 53562.